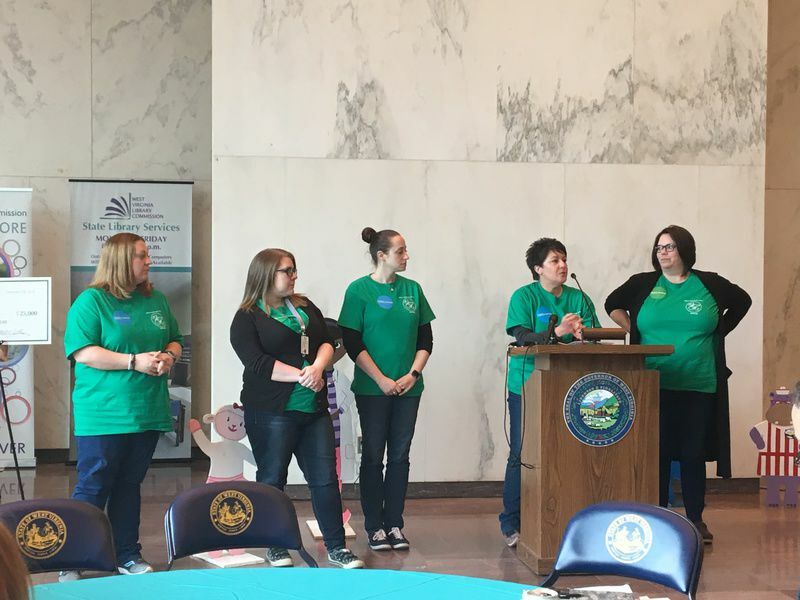 FMRS Health Systems representatives share success stories from Raleigh County during the Year of the Child campaign kickoff Wednesday in Charleston. Kim Pack, Director of Children’s Services at FMRS Health Systems, shares success stories from Raleigh County during the Year of the Child campaign kickoff Wednesday in Charleston. CHARLESTON — As the opioid epidemic continues to ravage West Virginia, a group of child welfare advocates gathered Wednesday to kickoff a campaign to ensure children impacted by the crisis aren’t forgotten. Caseman is leading “Year of the Child,” a year-long campaign to unite individuals working for the welfare of children, and to create ideas for meaningful solutions. Several leaders in child advocacy shared their ideas with the group Wednesday, including Necia Freeman, organizer of Backpacks and Brown Bags, who was featured in the Oscar-nominated documentary Heroin(e). Her idea is to house social workers at every school in the state — giving the social workers a safe space in which to work, and children and teachers immediate access to resources. She said she’s heard countless instances in which teachers have called Child Protective Services multiple times for a child in need. Ideally, she would like to see a county act as a pilot for the initiative, and then have the program rollout into other counties throughout the state. Gayle Manchin, West Virginia Secretary of Education and the Arts, said she hopes to see more schools focusing on a trauma-based approach. She said the state faces two main issues — babies being born to addicted mothers and children who come from homes with addiction. She said educators must be equipped, starting in their undergraduate studies, to handle children who’ve faced trauma. One program already in place to help educate school employees about trauma is Handle with Care, which not only educates, but connects law enforcement and educators to make sure the best outcomes are achieved for students. For example, if a law enforcement officer responds to a domestic disturbance call in which a child was present, the officer is asked to let the school system know to handle this child with care. No details of the incident are provided. Andrea Darr, director of the West Virginia Center for Children’s Justice, said every county in the state has now been informed about the Handle with Care program. For more information, visit handlewithcarewv.org. Kathy Szafran, president and CEO of Crittenton Services, said her organization offers comprehensive behavioral health services. In 21 counties, home health behavioral services are available, which Szafran said can be tremendously helpful. Another program, TIES (Trauma-Informed Elementary Schools), has also proven effective to help handle children with developmental and complex traumas. Representatives with FMRS Health Systems in Beckley shared some of their success stories with the group, too. Kim Pack, administrative director of children’s services, said tremendous strides have been made with four programs in Raleigh County, but especially the Children’s Mobile Crisis Response. The services of the response team have yielded a 59.3 percent reduction in acute hospitalization costs in a single year, saving nearly $4 million. Other programs showing promise include the Expanded School Mental Health, the Wraparound Program and RAPP (Resiliency in Appalachia). aid. For more information about FMRS, call 304-256-7100. Dr. Michael Brumage, Director of the West Virginia Office of Drug Control Policy, asked conference attendees to think a little more globally. He talked about smoking rates, alcohol use, gambling and cell phone addiction. He referenced the book “Hillbilly Elegy,” in which having one person made all the difference in the life of the author. Bringing communities together to advocate for and invest in children, he said, is the real challenge moving forward. To learn more about the Year of the Child campaign or how you can help, call 304-444-5917 or email kelli@wvahc.org.